It’s that time of year again. The 86th Texas Legislature convened January 8, 2019, and our University president – just as his predecessors before him – is mindful of UT’s relationship with the current occupants of the Capitol. Legislative relations can be tricky. Because the University is state-supported, the president, while wanting to adequately convey the needs, priorities, and aspirations of the campus to lawmakers, is prevented from roaming the halls of the Capitol to lobby on the University’s behalf. While alumni and other supporters have since assumed this important role, such was not always the case, especially in UT’s infant years. What’s a University president to do? An ingenious Sidney Mezes called on all of his resources and devised a creative, novel, and apparently successful, approach just over a century ago. 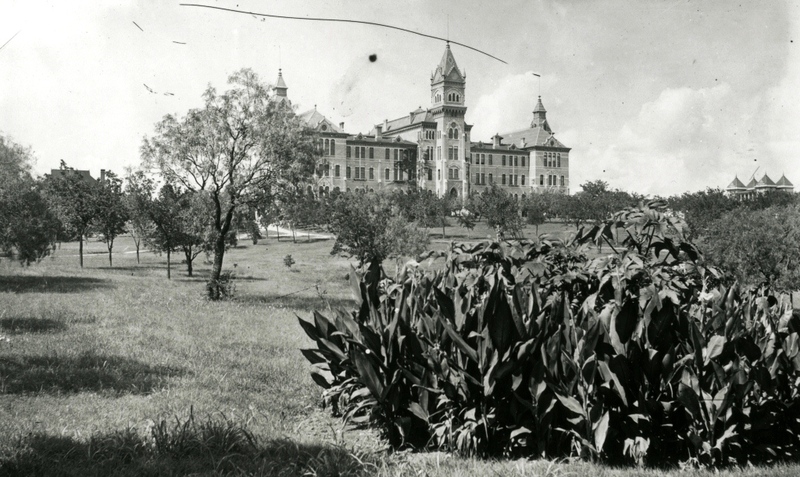 The old Main Building on the UT campus in the early 1900s. 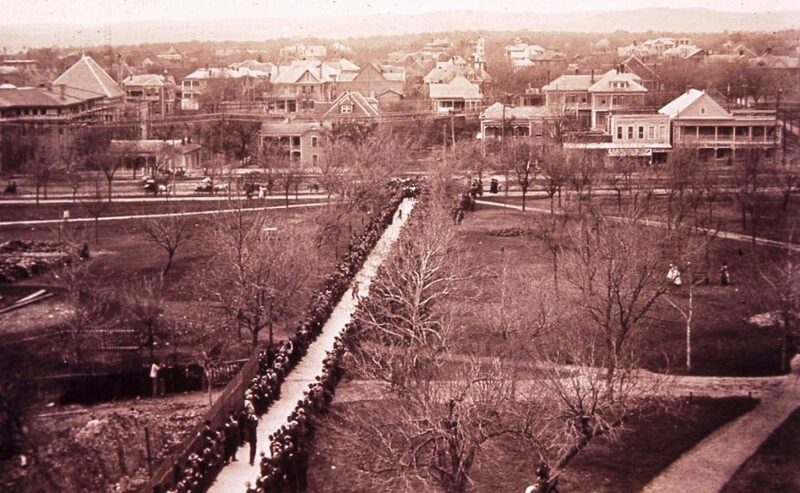 It was a mild and pleasant Saturday, February 18, 1911, when members of the 32nd Texas Legislature gathered at the west entrance to the University of Texas campus. 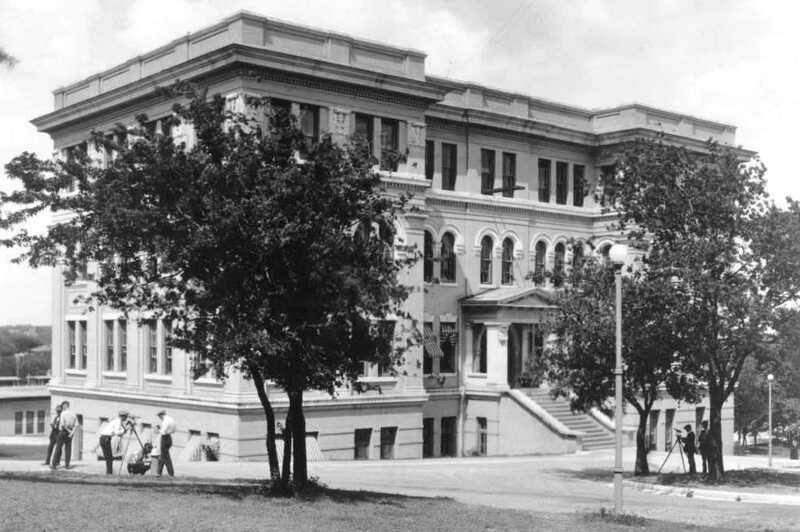 Shuttled from the state capitol in a caravan of electric trolleys, the legislators had been invited by UT President Sidney Mezes to a barbeque lunch, privately financed by a group of Austin citizens, and an opportunity to visit the buildings and grounds. The invitation was a welcome respite from a rather hectic legislative session. But if the lawmakers expected a simple, quiet meal, they would soon discover that on this particular day, the UT campus was anything but tranquil. The trolleys arrived promptly at 11:30a.m., and as the legislators disembarked and stepped onto Guadalupe Street, they were eagerly met by a cheerful President Mezes, most of the faculty, and the 25-member University Band. The visitors were politely ushered on to the campus, directed to the West Walk – which in future years would become the West Mall – and up the hill toward the Victorian-Gothic old Main Building. 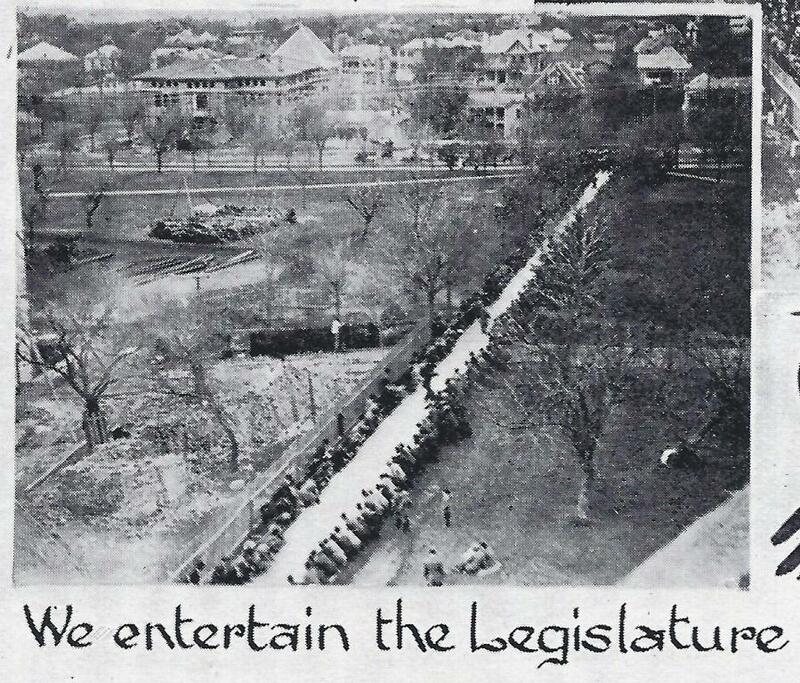 Above: Labeled “We Entertain the Legislature,” two small photos tucked away in a corner of the 1911 Cactus yearbook may be the last surviving images of the event. 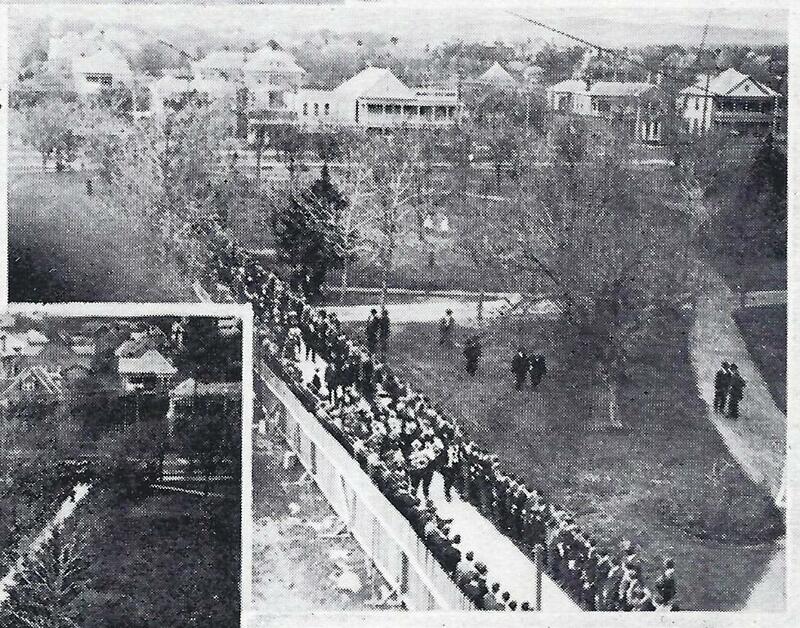 Top: The West Walk (now the West Mall) viewed from an upper floor of Old Main, while male UT students line each side. Most are sitting, waiting for members of the Texas Legislature to arrive from Guadalupe Street in the background. Bottom: Led by the University Band, lawmakers begin their procession up the walk. The wooden fence on the left secured a portion of the construction site for Battle Hall. Click on the images for close-ups. The procession continued to the crest of the hill, then around to the south doors of Old Main. Along the way, the group paused to view the progress of the new University Library, then under construction. Today known as Battle Hall, its broad, arched windows, red-tiled roof and colorful decoration would soon lend an air of architectural sophistication to the campus. 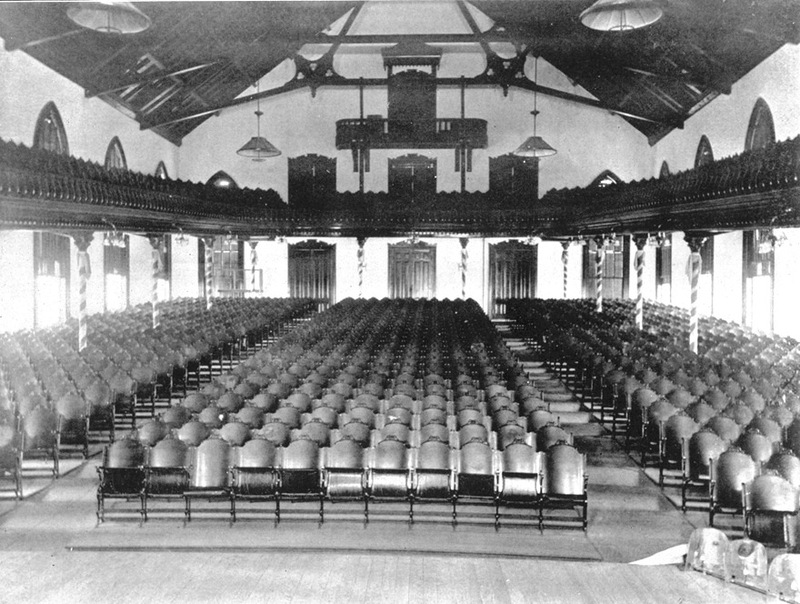 The University Auditorium in the Old Main Building. The auditorium was crammed well beyond its seating capacity. On the main floor, House and Senate members sat in the front center section, surrounded on three sides by the male students and faculty. The upstairs balcony was reserved for the female members of the University community, as cheering, yelling, or anything else above a polite applause was considered “unladylike” and strongly discouraged. 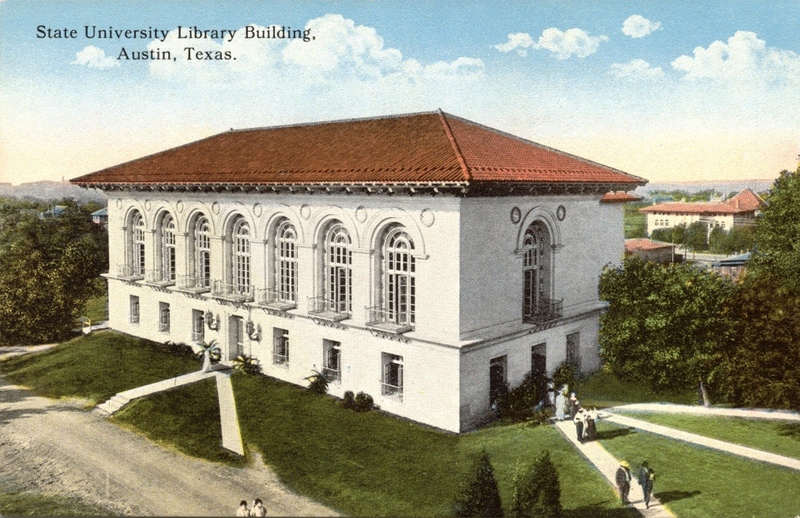 Displayed on the auditorium walls were large charts, painted on canvas, which compared the University of Texas to other state universities (e.g. legislative appropriations given to universities in Illinois, Wisconsin and California, among others, had been awarded more in a single session that the University of Texas had received over its entire history), UT enrollment from each Texas county, and other information that might be of interest to the lawmakers. Head yell leader and law student Gene Harris bounded upon the stage and conducted a boisterous series of UT yells in honor of the legislators. 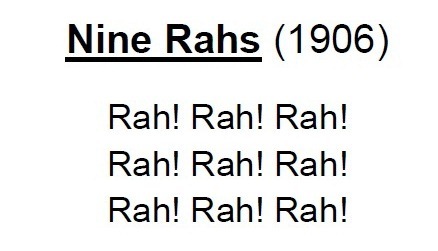 Among the cheers were the always popular Rattle-de-Thrat Yell and the Nine Rahs. In response, the lawmakers stood and performed an impromptu oratorical stunt of their own, though the specifics were, unfortunately, not recorded. President Mezes assumed emcee duties, welcomed everyone to the campus, commented briefly on the state of the University, and flatly told the legislators that UT’s future had been entrusted to them. Mezes then introduced four of the lawmakers – two each from the House and Senate – who addressed their colleagues in turn, emphasizing the needs of the University and expressing the desire to fill those needs. One of the presenters was to have been Sam Rayburn, a UT Law grad and the newly elected Speaker of the House, but legislative business required Rayburn to remain at the Capitol. In his stead was Austin Kennedy, who led the House in the previous legislative session. Kennedy prefaced his remarks by claiming no gift for oratory, and then promptly launched into a dramatic, heartfelt speech. He’d been denied the prospect for a higher education early in his life, and made an emotional appeal to his fellow lawmakers to ensure that such an opportunity existed for future generations of Texans. The old Engineering Building, currently the Gebauer Building. With the program concluded, a hungry crowd of legislators left the auditorium, retraced their steps outside Old Main, and then turned east to the Engineering Building, today known as the Gebauer Building. Waiting for them, sprawled on long tables on the front lawn, was an immense barbecue spread of beef, mutton, and pork, along with bread, pickles, and coffee. The lawmakers took their seats and were served by the best-educated wait staff ever assembled in the state: the University Faculty. After lunch, legislators took time to informally visit the University’s facilities, inspect classrooms and laboratories, talk with the students, and then took the mile-long stroll back to the Capitol. As the Saturday afternoon session began, the lawmakers discussed the funding of the University. For the University of Texas, the 1911 legislative appropriation was the most generous it had yet received. This entry was posted in Uncategorized and tagged Battle Hall, Jim Nicar, Legislature, Mezes, Old Main, Sidney, West Mall by jimnicar. Bookmark the permalink. Great read, Jim. I enjoyed this a lot.